Suffering from a sore throat or cough? Have no fear, the essential oil of the popular culinary herb thyme is an effective remedy for just about any infection of the throat or lungs. A 2011 study showed thyme oil to be highly effective against 120 strains of bacteria taken from patients with oral, respiratory and urinary tract infections, including several antibiotic-resistant strains. A 2013 study focused more specifically on strep throat. Of the 18 essential oils researchers tested, they found five that exhibited “significant antibacterial activity” against strep: thyme, oregano, cinnamon, lemon grass and winter savory. Dr. Axe recommends adding 2 drops of thyme oil to a mouthful of water and gargling to relieve sore throat. 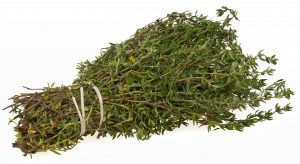 A 2016 study found that ingestion of thymol — a phenol obtained from thyme oil — significantly shortened the duration of upper respiratory infection, while alleviating cough and shortness of breath. The effectiveness of the combination of thyme extract, primrose extract and thymol was “comparable to synthetic antibiotic ambroxol,” the study’s authors wrote.